The Gentleman Crafter: Dylusions Canvas in Purple- Done! Prime the canvas with white gesso. Spray the canvas with Dylusions Crushed Grape Ink Spray and a dash of Black Marble Ink Spray. Use the Large Dotted Flowers Stencil and ghost the border. Use the Small Let It Snow Stencil with the Adirondack Pitch Black Paint Dabber for the darker border and corner flowers. Add more to the background with the Small Diamond of a Border Stencil. Add modeling paste flowers with the Small Dotted Flowers Stencil. Use the large tree from the Large Oh Christmas Tree Stencil. Mask off the remainder of the tree as well as parts next to it with blue painter's tape. On Manilla cardstock, spray the Crushed grape without misting with water (7) times. Once dry, ghost it with the dots from the Large Dotted Flowers Stencil. Cut "petals" out. Next, stamp "Art" from the Word Love stamp set on the edge of the petal. Following the steps above, spray (5) petals with the Crushed Grape and spray with water. Towel off the remainder of the ink. Stamp the circles from the Around The Edge stamp set and cut out. Last, following the steps above, mist (3) petals on cardstock with water and spray the Crushed Grape ink. Mist the inked cardstock again and towel off. Allow to dry. 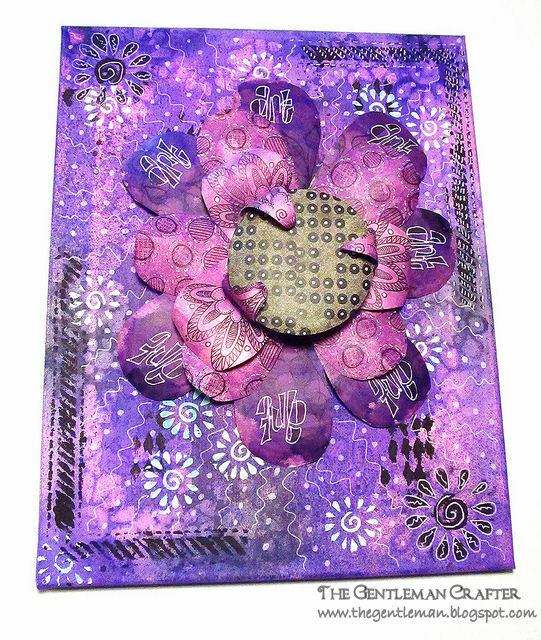 Next, stamp the three petals with the flourish from the Doodle Parts stamp set. Round the three petals over a pencil and fold in half, inked sides together. Lightly spray Black Marble Ink Spray onto Manilla Cardstock. Using something round, trace a 3-1/4-inch circle onto the cardstock. Stamp dots from the Basic Backgrounds stamp set onto the inked surface. Cut the round piece out. Starting with the (7) darker petals, glue them in a flower shape onto the canvas. Next, cut the tips off the (5) medium colored petals and glue those into place. Last, glue the (3) lighter folded petals into place. Adhere the circular flower center to the folded petals below and allow curved parts to come up and over the flower center. Add white detail to all the pieces, background and border with a Inkssentials White Opaque Pen. love your grapeness!!! wonderful! Love to see you getting inky! Thanks Kay! It's will be fun going to work with purple finger tips! LOL! Oh my purple goodness! Am loving these canvases! Thanks Lamb! I'm having fun doing them! It's a new world for me and what a blast I'm having! LOL! Have an awesome week dear one! Absolutely STUNNING heARTistry! Totally adore & love the use of crushed grape & the tutorial on the flower. Just Yummy eye Candy. LOVE it!! Who'da thought about using the tree stencil to make floweres?!?!?! Only YOU!!! So clever, Jimbo!! So awesome. I hope you hang these! Crushed Grape is my favorite so of course I would love this!!! You and Dylusions were made for each other!!!! Each piece is better than the one before it!! I love it purple is my FAVORITE color...Royalty you KNOW ... LOL ! !